Scott Sutherland, meteorologist and science writer for The Weather Network, is photographed with a moon globe at the network's Oakville, Ont. office, on Jan. 17, 2019. Scott Sutherland may not be a household name, but chances are you know his work. A backyard astronomy enthusiast and a science writer for The Weather Network, headquartered in Oakville, Ont., Mr. Sutherland has become a virtuoso at the dark art of moon marketing. His latest concoction is the “super blood wolf moon,” the vivid nickname that Mr. Sutherland coined for a total lunar eclipse that will be visible across the Western Hemisphere this Sunday night, starting at 10:34 p.m. ET. In case you hadn’t noticed, the term has gone viral, with most media outlets, from British tabloids to The Wall Street Journal happy to propagate the celestial meme. Last week, Stephen Colbert worked it into a bit on The Late Show. 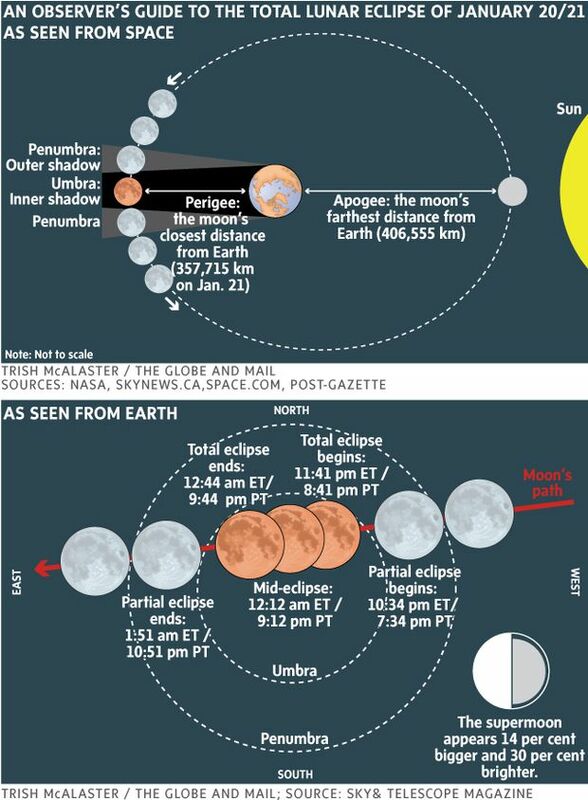 As a reminder, a total lunar eclipse occurs whenever the moon plunges completely through the darkest part of the Earth’s shadow, known as the umbra. Time was when the prospect of witnessing such a spectacle was enough to get people off the couch and out the door on a winter’s night. For the Instagram generation, however, nature unadorned doesn’t quite cut it. So when Mr. Sutherland wrote about the coming eclipse last fall, he felt compelled to put his own signature spin on it. “I was trying to find something catchy,” Mr. Sutherland said, adding that if he had simply called the event a total eclipse of the moon his story would have been factually correct, but unlikely to attract readers beyond stargazers such as himself. “If you’re trying to reach a wider audience you sort of have to build it up to draw them in," he said. While the name resonates like a bad heavy metal band, it is based on a trio of real concepts, which Mr. Colbert correctly elucidated for his viewers. Technically, Sunday night’s full moon is a “super moon” because it occurs when the moon is at perigee – meaning it is near its closest point to Earth in its elliptical orbit. At such times, the moon appears somewhat larger than average. It’s also a “blood moon,” an expression that has become a popular way of describing the main effect of a total lunar eclipse, which is to turn the moon a dusky red colour owing to sunlight refracted through the Earth’s atmosphere. Finally, it’s a “wolf moon” because that is supposedly what some Native Americans called the full moon in January. This comes straight out of the Old Farmer’s Almanac, but its provenance is somewhat dubious. Clearly, there was no “full moon in January” for Indigenous culture before Europeans imported their calendar to the New World. Putting the terms together, Mr. Sutherland first came up with “super wolf blood moon,” but decided “wolf blood” might give people bad ideas about a chronically demonized predator. “I didn’t like the sound of it,” he said. But after a quick swap to put “blood” ahead of “wolf,” he was off to the races. While Mr. Sutherland noted that someone else may have come up with the name independently, his article, posted on Nov. 26, appears to be the first online mention of the term. But if the NASA expression was the equivalent of Love Me Do, Mr. Sutherland’s “super blood wolf moon” is more like I Want To Hold Your Hand. No media outlet, it seems, can resist the nickname’s apocalyptic charm. Yet, the current mania for moon monikers is driving some astronomy educators loony. To be fair, Mr. Sutherland is motivated by a passion for science. In his articles and YouTube videos, he encourages his readers to pay attention to the night sky and he has previously debunked pseudo-scientific nonsense such as doomsday planetary alignments. As to whether people prefer their eclipses super, bloody, wolfish or just plain, the point is to look up and enjoy. The next total lunar eclipse does not occur until May, 2021. Mr. Sutherland said he hasn’t thought yet about what to call it.